“Toujours l’amour!” says pep every time he meets Penelope his love interest, Pepé Le Pew is a french skunk who is always on the lookout for romance, Pep never ever gives up his amorous quest for love, he is a casanova who is distinctively pungent, nevertheless his lover-boy antics are always a treat to behold. Pepé Le Pew’s is voiced by multi-talented Mel Blanc, combined with a creative English and French dialect, pep was an instant hit ! esp with the pickup lines which made him very popular, the accent+debonairsh persona makes him one of the most looniest toons ever. Permit me to introduce myself. I am Pepe Le Pew, your lover! I am the peanut butter. You are the jelly. Come, let us make a sandwich of love. I pierce you with the eck-eck of love, flower pot! Where are you, my little object of art? I am going to collect you! Did you know that when you are in love it is almost impossible to get insurance? But then, security isn’t everything. Everyone should have a hobby, don’t you think? Mine is making love…You are a girl, I am a boy, We have all that in common, darling. Eenie, meenie, miney mo, catch a lover by the toe, if she holler, hold her closer; eenie, meenie, miney mosa. O-U-T spells I love you! Come to me, my melon baby collie! I tell you what. You stop resisting me, and I, I will stop resisting you. When have you had a better offer than that? Turn out the lights, darling. I know where everything is. For her, I will make myself dainty! Le hiss, hiss…I am a snake and you have charmed me, no? Come, pink pigeon, we are wasting valuable time! Oh-ho, we are going to play “Ali Thief and the 40 Babas” yes? En guard rabbit! I am going to find you! There are plenty of fish in the ocean… if you like fish. Personally, I prefer girls. Hmm, call it a weakness. All right, Pink Rabbit. We have broken the ice. The courtship is now beginning…[kisses twice] Now starts the period of shy glances… [kisses] Fluttering eyelids… [kisses twice] Touching fingertips… [kisses three times before Penelope runs away] She must resist me because I am irresistible. What are you gonna do? And that is precisely what Anton Ego conveys in Pixar’s Ratatouille, Ego’s metamorphic journey is from an irksome critic to the more liberated/granulated one. His monologue is well-reasoned and is one of the finest piece of writing. This is just one of the reason why I love Pixar! …and indeed there is no mistake when you talk about Elzeard Bouffier – A fictional character of L’homme qui plantait des arbres(The Man Who Planted Trees); an animated film of a book by Jean Giono , which tells the story of a shepherd (Elzeard Bouffier) who reforests a barren part of France. It won an Academy Award for best animated short film in 1987. Attached with Jean Giono’s poetical affluence and with the vibrant images of Frederic Back, the short movie comes together in constructing a deep sense of reverence for the spirit of great beauty, hope that it naturally evokes. Strangely, Shreya Ghoshal’s tweet (Weren’t we given evidences that we are not even the size of a speck in the whole of the universe. Still we carry boulders of arrogance within us!! ) reminded me of this long lost and forgotten masterpiece. In parallel with Elzeard Bouffier Buddha-like persona, the book’s author Jean Giono says that “I wrote this story to make people love trees, or more precisely to make people love planting trees. Of all my stories it is one of the ones of which I am most proud. It has never earned me a penny and for that reason it has accomplished the very purpose for which it was written.” And the film unequivocally convinces that however bad life/world may seem, there is always something one can do, succeed, inspire and thus proudly conveying humanity is admirable and at the same time marvel at greatness of Human spirit, its tenacity of benevolence. Brave, is 13th full feature-length motion picture of Pixar studios, its first fairy tale film, its first film featuring a female lead, and its first film co-directed by a woman. “This is our first period piece. This is our first female main character. This is Brave.” says John Lasseter. 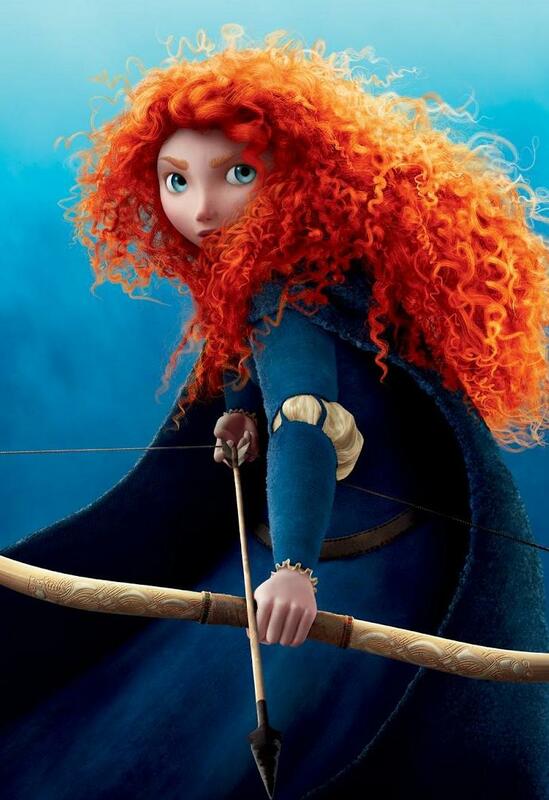 Brave is directed by Mark Andrews (Pixar short: One Man Band) and Brenda Chapman (The Prince of Egypt). La Luna which was the only pixar’s nomination for 2011-12 Oscars, precedes the full length feature. Written and directed by Enrico Casarosa, it tells a story of a young boy Bambino, who is caught in the middle of two personalities (grandfather, father). Their family job is to sweep stars on the moon and on a fine evening both of them introduces Bambino to their line of work. Both the grandfather and father exert control over him and want him to try to be like their own. Amidst conflicting opinions, Bambino somehow manages to finds his own voice which is also the central theme of Brave. Merida (Kelly Macdonald) is the young princess of a Scottish kingdom- DunBroch that is ruled by King Fergus (Billy Connolly) and Queen Elinor (Emma Thompson), just like Princess Zelda she is a skilled archer and with her pet friend Angus the Horse, she fearlessly wanders in the forests that hide dark secrets. Free-spirited, Impulsive, Rebellious, tangle-haired Merdia is a tomboy. Always up for an adventure, she wants to live her life, but her mother relentlessly attempts to turn her into a perfect princess. 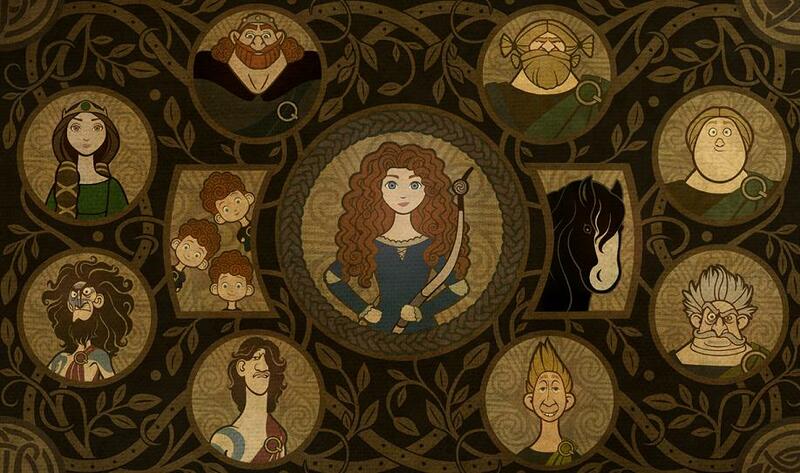 Elinor summons for the clans and wants Merida to get married into one of three Lords families. Lord Macintosh, Lord MacGuffin, Lord Dingwall each of the lords are determined to have his own son win princess Merida’s hand, but Merida intensely desires for freedom and King Fergus in a candid conversation with her queen pretty much sums up her daughters yearning “I only want to stay single and let my hair flow in the wind as I ride through the glen firing arrows into the sunset”. Merida humiliates the three clans and escapes into the deep forests where she follows a trail of wisps that lead her to the home of a witch. She asks witch to help her to change her mother. The witch puts a terrible curse and literally changes her mother into a bear. Merida feels regret over taking the unconventional path and has to set things right before the curse remains as permanent. The film successfully throws light on the sensitive topic i.e relationship between parents and their children, the effects of a strict parenting, the conflicting emotions that arise due to difference in interests and perceptions. Despite the fact that Merida and Elinor, are proud, independent and headstrong, they have their own different views but they never converge to a point and interact with their respective discrepancies. It is only when Elinor turns into a bear, that specific event triggers both of them to grow closer. Although Brave is very different,plainly whimsical, not so imaginative, ingenious than its other predecessors, the core-essential elements remain very Pixarish. The Characters, landscape is just incredibly detailed esp the Physics on Merida’s hair, it is so fascinating and magical in the way it moves. It has more than 1500 individually sculpted, curly red strands that generate about 111,700 total hairs. The only complaint : Wish I had watched this movie in 2D because all too often, most of the 3D frames looked too dark, murky and lifeless. The whole point of watching a movie in 3D is to experience the depth of an image that is realistic, larger than life. However, the 3D images completely removed the great exuberant aesthetic details for which Pixar is normally famous for. I am flabbergasted that Pixar’s Cars 2 is not nominated for this season’s Oscars. Animated movies with less competence such as A Cat in Paris, Chico & Rita have been nominated, its not that they are dreadful or terrible, they are extraordinary in their own visual style and narration. However, i must say that they do not have that quality that pixar offers. Probably, being a big fan of Pixar there is a little prejudice over the comment; nevertheless, 2011-2012 animated feature film nominees have not made any greater impact on the global audience. A Cat in Paris is a very simple French animated movie about a cat and how it helps its possessors, admirers to nab notorious gangster. Chico & Rita is a Cuban sensual-musical-romance with a true Jazz panache. It is painstakingly made, the method used is very different, ToonBooms : Automation of traced live action on paper. So, that’s the two foreign film nominees in this category. At least this time, Dreamworks animation has a greater chance of winning an Oscar for Best Animated Feature. Kung Fu Panda 2 and Puss in Boots are its two nominees; both are very much entertaining and reflect the greater efforts of computer power, very detailed, complex movements of its characters. The same is for Verbinski’s dull, morose Rango. I really like this category for the fact that is very different, unique when compared to its larger compatriots and a lot of ideas are expressed in a matter of few minutes. Dimanche is a delightful story that communicates the important lessons about life as seen through the eyes of a child. Inspired, by Hurricane Katrina, Buster Keaton, The Wizard of Oz, and a love for books, The Fantastic Flying Books of Mr. Morris Lessmore is an artistic story about therapeutic power of books. Finally a pixar nominee: La Luna is A fable of a young boy who is coming of age in the most peculiar of circumstances. Inspired by a short story titled “The Chicken.”, A Morning Stroll is a 9-minute film takes place in the years 1959, 2009 and 2059 and wraps itself around a variation of the whole “chicken crossing the road”. Finally, My personal favorite Wild Life, directed by Amanda Forbis and Wendy Tilby, of “When the Day Breaks” , “Strings” fame. Wild Life tells the story of a well-groomed juvenile who is sent to Canada from England to attempt ranching in 1909 and his life is metaphorically compared to a comet! Beautiful work! The Essence, beauty persists in the allegorical truth of a comet! Finn: Finn McMissile, British intelligence. Mater: Tow Mater, average intelligence. Well, for the first time Pixar has produced a movie that reflects the above statement. Although, this is from a huge pixar fan, the movie is indeed of average intelligence. Cars-1 was the frailest of the all Pixar movies and Cars-2, currently holds that status. Perhaps this claim may just be a hyperbole because when you compare Cars-2 with the other animated movies released this year; Kung Fu Panda, Rio, Rango. Cars -2 is certainly much more technically, socially, culturally superior. It is just that weight of expectation on Pixar has exponentially increased over the years and that overly high expectations, in this case are not being met. As it has become a norm of Pixar to begin its movie with a short animated feature, for Cars 2 it was “Toy Story Tunes: Hawaiian Vacation,”. Ken (Michael Keaton) and Barbie doll (Jodi Benson) prepare themselves to spend their honeymoon in Hawaii, but their plans are bungled as Bonnie leaves the bag in her room. Ken is utterly devastated but Woody (Tom Hanks), Buzz (Tim Allen) and the rest of the toys have a plan to turn bonnie’s room into Hawaii! This animated short feature is just brilliant, very Pixarish. So much is conveyed in such a short span of time. A sparkling short feature that is Refreshingly creative, really ingenious stuff from Pixar. 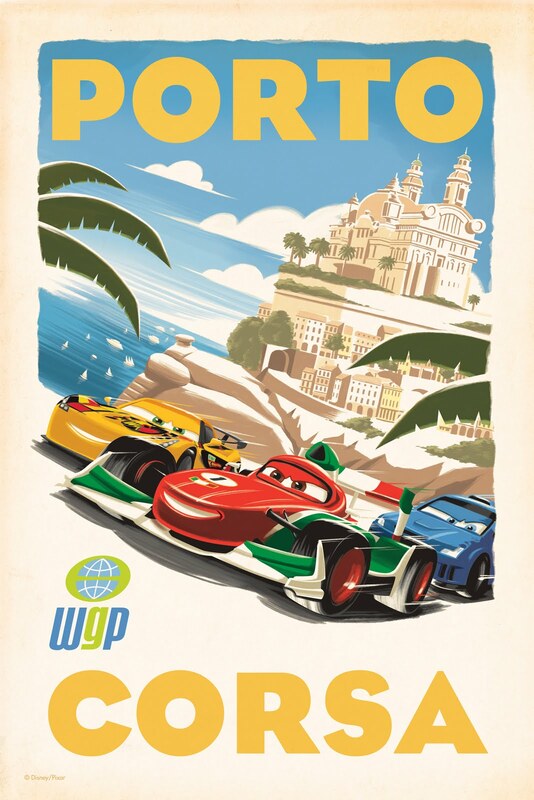 So, in Cars- 2, Lightning McQueen (Owen Wilson) returns to home after winning Piston cup a record – 4 times, he wants to spend some time with his soul-mate Sally (Bonnie Hunt) but his best friend Mater (Larry the Cable Guy) pokes around and involves McQueen to compete in the first-ever World Grand Prix. At the same time, british agents Finn McMissile (Michael Caine) and Holley Shiftwell (Emily Mortimer) are in a pursuit to bring down the wicked Professor Z (Thomas Kretschmann) who is developing a secret weapon to turn the world against alternative energy. The agents recruit Mater in an international espionage mission to stop Professor and travel Japan, Italy, London to put an end to the sabotage on cars. Cars 2 is a simple spy adventure which neither makes you involve in the characters nor in the story. It is because of the pace it carries along with it, also there are so many things happening at the same time. However, the good thing about the movie is the artwork. 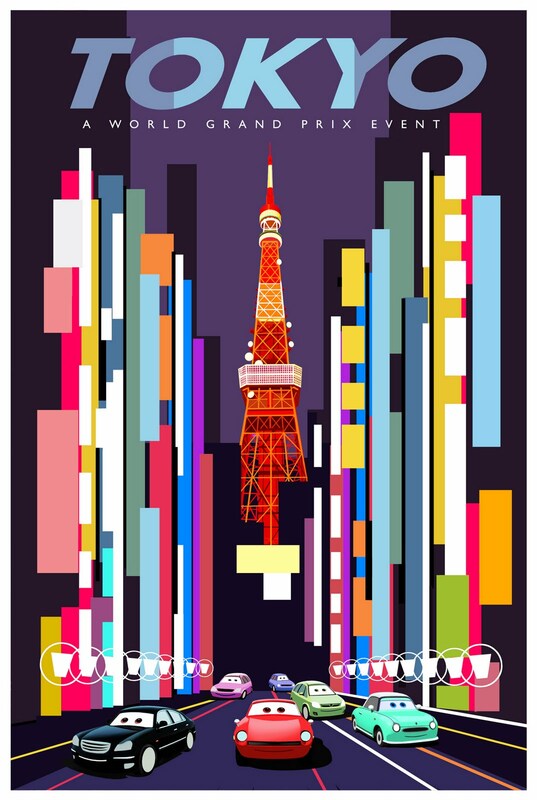 Each frame is so meticulously prepared, especially: Tokyo and its neon-tinted streets. Also, the minute details wherever the grand prix operates. Its ethnicity, vibrancy, captured brilliantly. The pope (a car) inside his pope-mobile. The truck raking sand in a Japanese rock garden. The tiara on the British monarch car. It is fun, engaging and I enjoyed the movie but it is deficient in communicating the essence, The Beauty of Pixar. Tonari no Totoro is an animated film written and directed by Hayao Miyazaki: Founder of Studio Ghibli, who is one of the biggest icons in Anime industry. Also, Miyazaki is one of the greatest anime directors of all time simply because of his unblemished creative vision, the simplicity, the affluence; the dreamlike impression marked with amazing radiance that grips your heart as you sit in delightful elated reverie. I got introduced to Studio Ghibli via a superb movie called “Spirited Away” and since then i’m hooked to it. The firm’s logo is character Totoro. 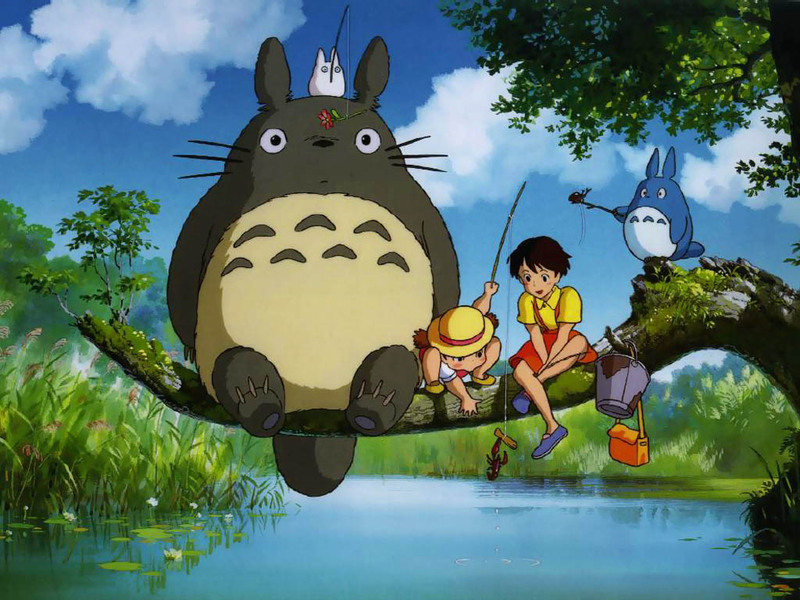 Tonari no Totoro is the fourth film of the studio and Totoro ultimately became a well-known icon in Japan. Set in Rural Japan, Satsuki (10) and Mei (4) move to their new home with their Dad. Their mother is admitted to a nearby hospital and is on the road to recovery. They first encounter small black spirits called susa-atari (Soot balls) which live in dark places. They meet old lady who was the caretaker of the house before they moved in. She has lived in the village all her life and is familiar with all the old folk stories filled with astonishing creatures. They all settle down in their new home, Satsuki goes to school, the younger sister: Mei remains at home and Mr.Kusakabe is a professor at university. Satsuki is very outgoing and happy person, Mei-very inquisitive, adventurous; Mr. Kusakabe loves his daughters very much and encourages their imaginations. In the garden, Mei encounters two small creatures (Chu Totoro and Chibi Totoro). She follows them until she falls into a hole of a giant Camphor tree. There she meets a similar giant creature named ‘Totoro’(forest spirit), exhausted she falls asleep on the soft tummy of Totoro and when she wakes up finds Totoro missing and returns home. Her attempts to find the secret hiding place of Totoro goes in vain as the hole which she had fell in had mysteriously disappeared. On a rainy evening, Mei and Satsuki decide to pick up their father from the bus stop. 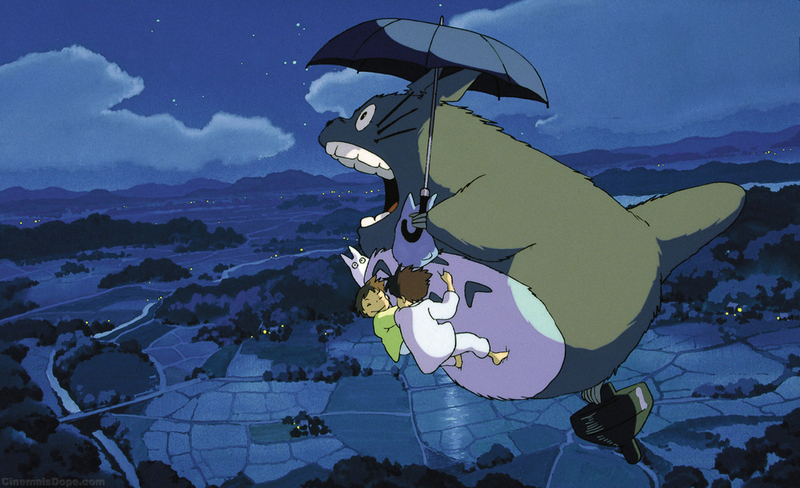 Satsuki meets Totoro for the first time and offers an umbrella to take cover. Totoro is overjoyed with his new-found gift and in return proudly presents a package of seeds to Satsuki. A cat with a hollow body that serves as a bus (Neko Bus) appears and Totoro embarks on it. Satsuki and Mei plant the seeds in their garden. In the midnight, Totoro, Chu and Chibi gather around the planted seeds and dance, Mei and Satsuki join them in their little dance, the seeds sprout and grow into a tree. Totoro takes them for a ride over the village on a flying top, they sit on the tallest branch of the tree playing flute. One day they receive a telegram relating to their mother’s health. Satsuki gets really anxious and yells at Mei, Mei with a cornstick leaves village in hope of seeing her mother. Satsuki realizing Mei’s absence asks Totoro for help. Totoro summons Neko Bus and they finally locate Mei. They visit the hospital, sitting on a tree branch, watch their mother who has now fully recovered from her long-illness. Mei drops the cronstick at bottom of a window opening. The sisters happily return and prepare to welcome home their mother. The story is very simple, may not be as impressive as other Miyazaki films but it perfectly captures what it is to be a child. It is so well directed and animated that it articulates about the individuality of characters, giving them room to grow, to flourish, to believe in what they do. Mei stands apart; brimming with dynamic exuberance, the innocence, inquisitiveness, and expressions – Flawless. It’s pure bliss that radiates throughout the film. Joe Hisaishi’s soundtrack is also very inspiring. Totoro is very special and in that it frees the viewer to be a child again and to contemplate the world through a perspective that we have perhaps forgotten.